Eric Rasmussen. 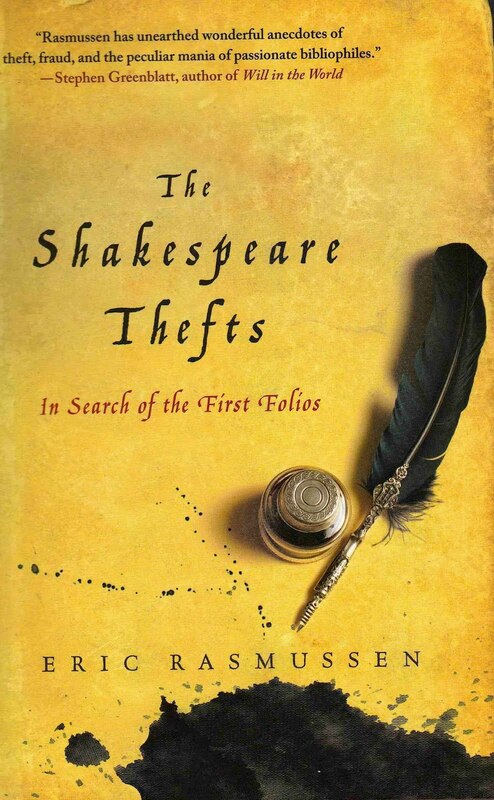 The Shakespeare Thefts: In Search of the First Folios. (Palgrave / Macmillan, London 2011) £16.99. Bibliomania, as anyone who is familiar with the literature on book thieves will know can drive normally respectable people to crime. It can also make scholars and journalists into literary detectives. Allison Hoover Bartlett, the journalist who tracked down John Gilkey in The Man who Loved Books too Much encountered a motley crew of bibliomaniacs along the way, including at least one murderer, while American Shakespeare scholar, Eric Rasmussen, whose The Shakespeare Thefts has just been sent to me, combed the globe to compile a definitive scholarly list of First Folios and decided found that the stories attached to so many of the 232 extant copies, were too amazing to be ignored. Just as Bartlett constantly asked herself why people become mentally unbalanced in their pursuit of certain books—even to extent of killing to obtain them—Rasmussen begins his account with a similar question. What is it about Shakespeare’s First Folio that so fascinates both thieves and collectors. It can’t be because the world’s greatest writer had much to do with what is, after all, a posthumous volume; Shakespeare never saw it appear. He never read it; others compiled it from printed sources, notably the quartos, which having been published in the writer’s own lifetime, are undoubtably closer to the man. Are some collectors more obsessed with owning a quarto ? Rasmussen doesn’t say. We have to accept, I suppose, that to those who know little or nothing of the genesis of the First Folio , it alone has become Shakespeare’s ‘ book ‘. To the man in the street it remains the fountain from which have flowed, subsequent editions, including all the texts children and undergraduates have pored over around the world for centuries. But murder someone for a Folio ? This seems very likely in the case of the Fiske Harris copy, which ended up in the hands of an unscrupulous bookseller following the unexplained death in 1883 of a well-known American collector and his wife in a boating accident. But acquiring a copy in such a ruthless way is thankfully rare. Throughout the centuries, most copies have been stolen from libraries, only to end up centuries later in other libraries. One king was relieved of his copy. While escaping by boat to the Isle of Wight in 1647 Charles I took his own First Folio with him only to have it confiscated by the island’s governor when he embarked. The book passed through the hands of several collectors before it landed up in royal hands again, when George III acquired it for the Library at Windsor in 1800. Libraries seem particularly unable to keep their First Folios safe from thieves. One of the funniest stories concerns a copy in William College Library in Massachusetts. In 1940 a gang member wearing the ‘uniform ‘ of an academic , that is ‘ an ill-fitting suit and a pair of old-fashioned eye-glasses ‘ managed to convince staff that he was bona fide. Left alone with several folios, it was even easier for this bogus professor to fish around in his brief case for a practically worthless copy of Goethe’s Reynard the Fox (1872) which had been smuggled in to replace the Folio. The thief then left hurriedly with his prize on some pretext or other. After much negotiation the book was recovered, thanks to good detective work. However, it might easily have been lost for ever. Seventy years on, book detection has come a long way, and thieves today need to be much more au fait with the workings of the book trade, book history, bibliography and textual criticism to succeed. 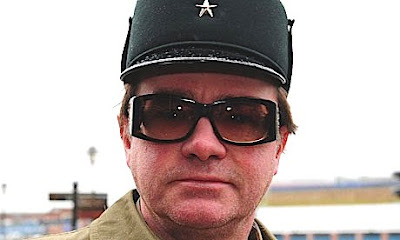 We know how even supposedly ‘ clever ‘criminals like William ‘Tome raider’ Jacques and Dr Simon Heighes, come a-cropper, but Raymond Scott, a Walter Mitty-like character from a council house in County Durham, who was sentenced to 6 years in 2010 for stealing a First Folio from Durham University Library, was hopelessly out of his depth from the start. His big mistake was to believe that if he removed the first and last pages of his copy, it wouldn’t be recognised. Alas, for the unemployed carer, who was living the high life in the Caribbean on the expectation of selling his book for a cool million, the curse of the First Folio triumphed. For this review much thanks Robin. Bit of a first for us - being sent a book to review. If the trend continues we will have a pile of books to sell and will have to call in a dealer! Hang on a mo, don't we buy review copies? Might make a low offer however...Pic of the Mitty-like Scott above. In 1976, while attending Ohio State University, I had the opportunity to hold an first edition of a Poe publication in the rare book library. I noticed the librarian never took his eyes off me; notfor a moment. But, oh, that feeling of power to hold the original in my hands. Many thanks indeed for this Robin fab piece - have had to order the Rasmussen book now! Nigel dinna know if you noticed but you have a mention again in JC's page on back of TLS - he says 'to which we will return' so presumably more this week. Not forgetting the collecting mania of Henry Clay Folger - the Folger Library owns 82 copies of the First Folio. Didn't Bodley pay a great deal of money to re-acquire the First Folio it had discarded as a duplicate centuries before, when it received a later 17th c folio?